We were one of the few privileged publications to be invited to the premier of BattleDrift2 at Goodwood Festival of Speed 2017. This was the first public showing of the second installment of BattleDrift and couldn’t have been set at a more prestigious and historic event. BattleDrift 2 features Daigo Saito in his 2002 Lamborghini Murcielago (as seen in BattleDrift #1) but this time he’s joined by UK drift legend and BDC champion Steve “Baggsy” Biagioni. Baggsy’s vehicle of choice for BattleDrift 2 was his custom built 2009 Nissan GTR, pushing out in excess of 1100BHP from its forced induction 7.4 litre LSX Chevy powerplant. Set in Sheerness on the Isle of Sheppey (Kent) the two drivers are challenged by your stereotypical “hardman” to make a “bloody good video”. They did not disappoint. Its hard to imagine how Monster Energy could follow up the first in the BattleDrift series, rest assured they smashed it! The premier itself was hosted by Nic Hamilton, British Touring Car driver and Brother of a rather famous F1 driver. 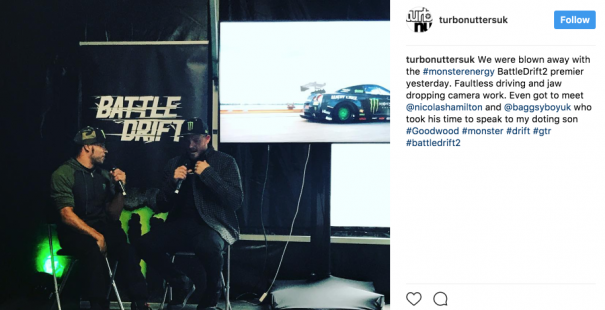 Although Nic wasn’t used to being on the other side of an interview he performed flawlessly and gave both Baggsy and star of BattleDrift 1, Vaughn Gittin Jr.l, a good grilling. We managed to spend a little time with Steve who was interviewed by our youngest Assistant Editor (9) and expert Forza 6 Drifter. He revealed that the damage to the rear bumper as shown in the video looked much worse on film and did not interrupt their grueling shoot schedule. Monster Energy have yet again raised the bar in this latest production. This action packed video has set the bar for anyone who dares to follow. That’s enough waffle, lets see what all the fuss is about. 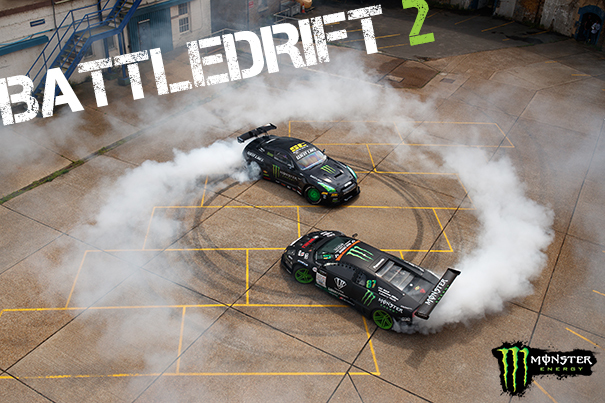 For more information on BattleDrift 2 check out the Monster Energy Website. We’d like to thank Monster Energy for their hospitality on the day and for making it such a special day for our youngest editor in training. ‹ Is That Motor Financing Arrangement Right For You?